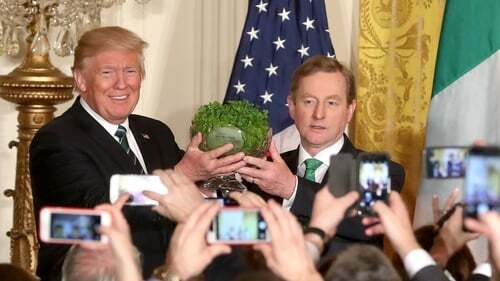 Taoiseach Enda Kenny has made the traditional presentation of the bowl of shamrock to US President Donald Trump at the White House. The presentation was made as part of the St Patrick's Day celebrations. The bowl was designed by Criostal na Rinne, a crystal studio workshop in the Waterford Gaeltacht of An Rinn. The design of the bowl is based on artwork in the Book of Kells. Mr Kenny spoke of what St Patrick's Day celebrated around the world and said that in many ways, St Patrick was the patron saint of immigrants. He said that the ties that bound Ireland and the US together were "deep and historic". Mr Trump spoke of the "amazing contribution" that the Irish had made to America - "more than anybody truly knows". He said he was very familiar with the "fighting Irish" spirit of the Irish people. He said that the US needed "a lot of things, but what it really needed was that great Irish confidence". President Trump also pledged constant loyalty to Ireland "as America gains a new strength" and concluded by explicitly calling for God to bless the Republic of Ireland, Northern Ireland and the United States of America. In addition to the crystal bowl of shamrock, the Taoiseach gifted the US president Declan Killen cufflinks and a Bord Bia hamper. He also gave him some Irish linen and a Carrickmacross lace brooch for US First Lady Melania Trump, and a copy of "The Moon Spun Round" by WB Yeats for Children was gifted to Mr Trump’s young son Barron. A framed copy of the census of Ireland 1911, including details of US Vice President Mike Pence's Grandfather Richard Cawley, and his Great Grandmother Ellen Cawley was presented to Vice President Pence. Earlier, Mr Kenny said he and Mr Trump had "a very constructive, beneficial talk" about immigration. After their meeting at the White House, Mr Kenny said Mr Trump was surprised at the number of undocumented Irish in the US, saying "I think he might have felt that that might have been a higher figure." Mr Kenny said: "At the end of the day, this is going to require co-operation on the Hill between Republicans and Democrats, and the President is very conscious of the majority that the Republican Party has in the Senate and in the Congress." He said that his conclusion on the discussion, was that "there is clear agreement to work constructively in this regard to deal with this matter." The Taoiseach also said: "I would say to Irish undocumented, that if there are small issues like parking fines or traffic lights or whatever, they should clear those up through their legal people. " That's an issue that can lift the concern and the fear and the anxiety that many Irish undocumented might have." Meanwhile, President Trump has said he will come to Ireland during his term in office. Responding to a question from RTÉ News, Mr Trump said he was planning to visit Ireland during his term in office and said that he loved Ireland - "absolutely, I'll be there for sure." Mr Trump also tweeted a two-minute video montage saying it was an honour to welcome Mr Kenny to the White House. After their meeting, Mr Kenny said the two leaders had discussed the election in Northern Ireland and the potential issues around the border due to Brexit. He told reporters that the President had asked a number of questions about what the hard border had meant in the past. The Taoiseach said he had informed Mr Trump about customs posts, the sectarian violence that had come with this and that during those times it had been impossible to travel from some counties in the Republic into Northern Ireland because of roads being impassable and blown up. He said he had given President Trump a detailed account of the outcome of the recent election in Northern Ireland and told him of the priority to put together an executive that would provide a voice for Northern Ireland. He said he had pointed out that he had a clear agreement with the British government that there would be no return to a hard border or no reinstatement of direct rule from London. Mr Kenny said they also spoke of the wider difficulties a UK exit from the European Union would have across the island of Ireland. He also told the President of the difficulties that Brexit would have for Ireland and for Northern Ireland and about the economic indicators that there would be adverse affects; that because of currency fluctuations, food industry exports into Britain were down by €500m. He said he emphasised to Mr Trump the potential for future transatlantic trading opportunities. Mr Kenny indicated the administration's priorities in terms of immigration were securing their borders and cracking down on criminality. The Taoiseach added: "Ireland will always be a friend of America, the European Union will always be a friend of America and that cooperation between these two most developed economies will be to the mutual benefit of millions of people in Europe and the United States." The encounter was the new president's first face-to-face meeting with a leader of one of the 27 EU states that will remain in the union post-Brexit. Mr Trump has been a vocal critic of the EU, having praised the UK's decision to leave, and the prospects of securing a bilateral transatlantic trade deal between Europe and the US appear to have receded under the new administration. The Taoiseach has said Europe needs to do more to convince the US leader of the worth of the EU project. Sinn Féin leader Gerry Adams said Mr Kenny was "on the button" when he appealed to Presiden Trump to support the Irish undocumented. Mr Adams was a guest at Speaker Paul Ryan's St Patrick's lunch along with Mr Kenny and Mr Trump. He said the challenge was to turn words into action. "The St Patrick's festival here in the US is a great period of celebration of Irishness and it's very important." Mr Adams held meetings with the Friends of Ireland Caucus as well as discussions with individual congressmen and senators throughout today and said He said addressing the needs of the undocumented was key. "We made representations to the folks on Capitol Hill and I intend writing to the president about that," he said. "It's clearly a huge issue, not just for the Irish. We are from Ireland so our particular interest is in our own folks, but the immigration policy which the president elect promised, we would like to see that tweaked in the upcoming period. "And I know there is very strong support for that right across the USA." Earlier, Mr Kenny told the US Vice President Mike Pence that the United States will always have a friend in Ireland and a friend in the European Union. Speaking at a breakfast in the Vice President's residence to mark St Patrick's Day, the Taoiseach said that he wanted to wish the new administration "every success and good luck" in dealing with "the many international and global challenges" they face. Mr Kenny said Mr Pence and President Trump now "occupied two most powerful seats in the world", adding that they had "within their responsibility the opportunity to deal with many of those". He said it was "not easy" but that they would "get help from Ireland and from the EU". He said: "Ireland and the EU will never be but a friend to the US." Mr Pence began his speech with a "top of the morning" and talked about his grandfather Richard Michael Cawley who emigrated to the US in 1923. The Taoiseach said he had given the Vice President the gift of a hurley with his name on it in Irish and the number eight. Mr Kenny said that when he presented it to Mr Pence, he joked that the Secretary for Homeland Security John Kelly "might have all the weapons and the armaments but I've got the ultimate weapon for the protection of the Naval Observatory". Mr Kelly was present along with Congressmen Peter King and Tom Rooney, and former Congressman Mike Fitzpatrick.